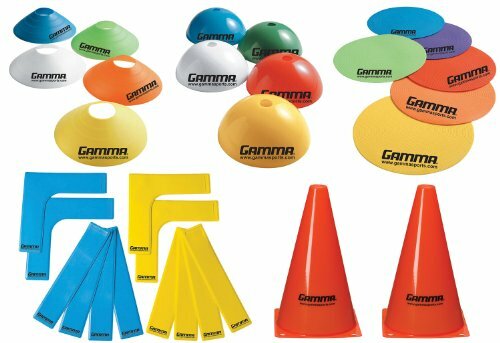 The GAMMA Court Market Kit is a complete court marker set for lessons and USTA 10 and Under Tennis. Contains: 5 Dome Cones, 5 Disc Cones, 6 Court Spots, 5 Target Cones (9”) and 12 Court Marker Lines. Complete court marker set for lessons and USTA 10 and Under Tennis and driveway play. Includes 5 Dome Cones, 5 Disc Cones, 6 Court Spots, 5 Target Cones (9") and 12 Court Marker Lines. USTA approved for 10 and Under Tennis.